Were you able to figure it out? Congratulations to Showmerockhounds for getting it right. This picture shows the carapace of a decapod crustacean, the group that includes crabs, crayfish, lobsters, and shrimp. More specifically, it is Imocaris tuberuculata, a crab generally considered to be in the group Dromiacea, within Brachyura. The name means crab from the Imo Formation, which is where it was found by Frederick Schram and Royal Mapes in a roadcut along I-65 near Leslie, AR. The rocks around Leslie are a great place to hunt for invertebrate fossils, numerous specimens have come from there. Imocaris is very rare, but quite distinctive, with a carapace that looks like a frog-headed bodybuilder wearing enormous sequined parachute pants. Imocaris is an intriguing fossil in that the Imo Formation is thought to be Carboniferous in age, in the Upper Mississippian Period roughly 320-330 million years old. Even though the fossil record of decapods goes back to the Devonian Period, few exist in the Paleozoic, not really hitting their stride until the Mesozoic Era. 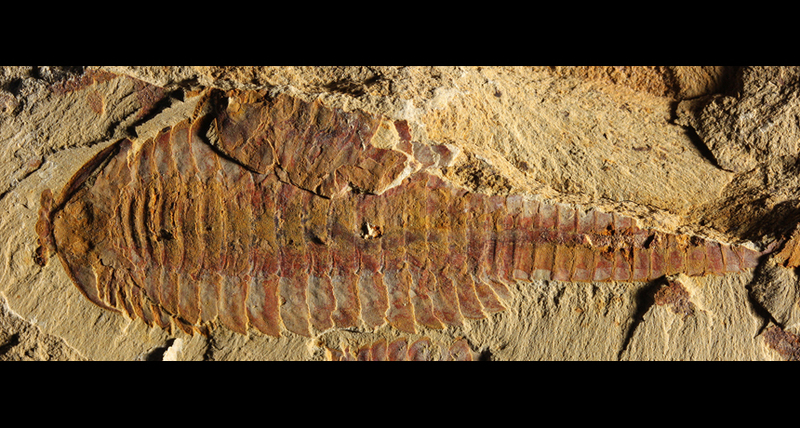 The fossil record of crustaceans as a whole go all the way back to the Middle Cambrian over 500 million years ago, with specimens found in the Burgess Shale. Thus, the true origin of the crustaceans must be even earlier than that, probably some time in the early Cambrian or the Ediacaran, the latest stage of the preCambrian Era. 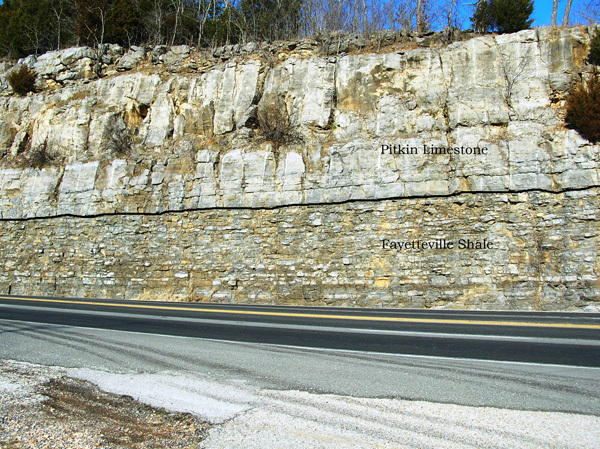 The contact (black line) between the Pitkin Limestone (above) and the Fayetteville Shale (below) along highway 65 near Marshall. Arkansas Geological Survey. The Arkansas Geological Survey calls the Imo Formation as a member of the Pitkin Limestone Formation. The Imo is a shale layer interspersed with thin sandstone and limestone layers found nearthe top of the Pitkin Formation. The Imo, and the Ptikin in general, demonstrate a shallow marine environment indicated by the limestone and an abundance of marine fossils. Most of the fossils are invertebrates showing off a thriving coral reef system, but you can also find conodonts and shark teeth as well. The Pitkin Limestone sits on top of the Fayetteville Shale, itself well known for fossils, particularly cephalopods. The boundary between the two can be seen along I-65 closer to Marshall. Life in the Carboniferous oceans. Frederick Schram & Royal Mapes (1984). 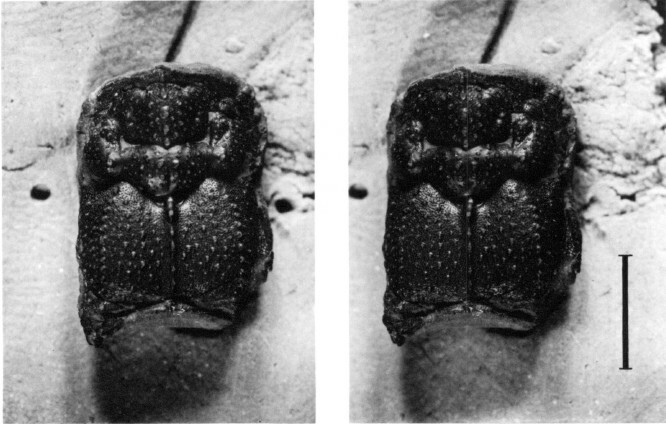 “Imocaris tuberculata, n. gen., n. sp. (Crustacea: Decapoda) from the upper Mississippian Imo Formation, Arkansas”. Transactions of the San Diego Society of Natural History 20 (11): 165–168. If the cold and the ice (or lack of ice for those of you hoping for a day off from school) has gotten you in a bad mood, see if you can distract yourself with solving this week’s mystery fossil. This week I am presenting something totally unlike anything I have presented before. The scale bar in the photo is 5 mm. I was talking with someone at an educator’s conference of all places that asked me how, if evolution was true, could monkeys still exist. Surely evolution meant that if we evolved from monkeys, that monkeys should no longer be around, right? This is a common misconception. I might even say it is the most common misconception I run across. It is so common, in fact, that paleontologists really get tired of hearing it because it means the person does not understand how evolution works at all. Matt Bonnan, a well respected paleontologist that mostly works on the giant, long-necked dinosaurs called sauropods, in a period of frustration, penned this cartoon. In it, he explains the first thing I ask people: Did your parents die when you were born? Did your parents become you? No, of course not, that’s silly. So why would you think that an entire species has to go extinct when a new one evolves? Evolution generally works the same way. Just as your parents and their siblings continued to exist after you were born (barring tragic occurrences of course), species seldom evolve all at the same time in the same way. There are almost always some populations of a species that do not noticeably evolve, at least, not in the same way. As a result, one can usually find populations of the parent species long after new species evolve. We see the same thing in TV shows. Just because CSI spun off CSI:New York and CSI: Miami, that did not mean the original show was cancelled. All three happily continued to air alongside each other. This is pretty obvious when you think about it in other contexts. So why do people think evolution works differently? It all has to do with an old belief called the Great Chain of Being. While it had its origins as early as Aristotle’s Scala Naturae, it reached its heyday in the medieval Catholic Church. 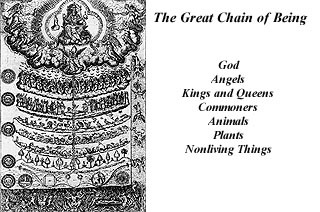 This chain organized all of existence into a hierarchical system with rocks and minerals at the bottom and God at the top. Some of them got very detailed, even putting different minerals in order. Of course, all of them had humans as the pinnacle of earthly creation, with the nobility and kings above all as the highest order of Man. This type of classification still holds sway to this very day for many people for a very powerful reason. For people with a hierarchical worldview, this is very appealing. Everything has its place and the Great Chain of Being strictly lays out who has authority over who. It is neat, tidy, and ordered. It also feeds into normal human desire to feel special. It enshrines human exceptionalism into the very soul of the worldview. And this is where people run into a brick wall with evolution. Evolution tears apart this neat, ordered hierarchy. Life becomes messy, without clear boundaries and order. Most importantly, evolution, as they see it, makes no distinction between humans and the rest of the system of life. It puts humans as just another branch on the great family tree, with nothing inherently special putting humans on top and that simply will not do. I do not mean for this to be taken as derogatory of any particular religious belief or religion in general. The need for order and security and to feel important and with a purpose are understandable human desires with a rational basis at their core that we all feel to some extent. Unfortunately, when applied to natural history, all available evidence indicates it is wrong. So if evolution does not work this way, how then does it work? 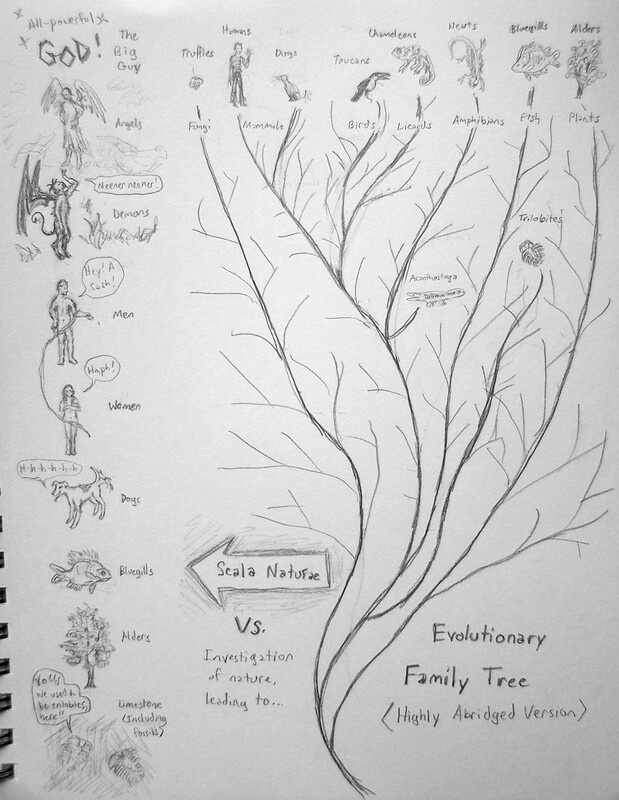 How should evolutionary lineages be considered and how do species evolve? Let’s tackle the latter question first and then see how it looks on a grander scale. There are many ways organisms can create new species, or speciate. But there are two main patterns. 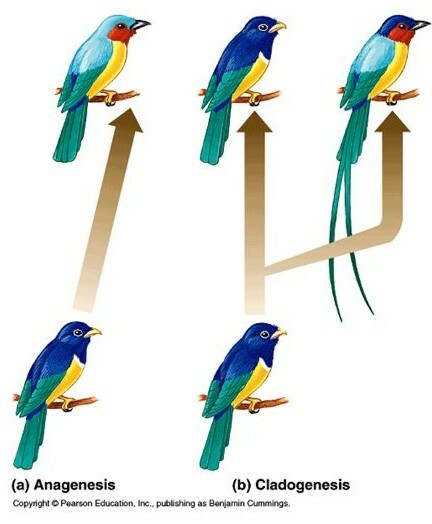 One is similar to the incorrect view of evolution shown above, in which a species gradually evolves into another species as a unit due to changing environmental conditions, such that the original species and the new species are only in existence together for a brief transitional period. This is called “anagenesis”. This sort of speciation has been proposed most commonly in groups like ammonoids (Mesozoic shelled squid-like creatures) and foraminifera (a large part of plankton in the oceans). On a side note, this sort of speciation plays havoc with interpreting the fossil record because it creates what is known as “pseudoextinctions”, in which the original species appears to have gone extinct when in reality it just changed. The other pattern, and the one that is considered far more common, is called “cladogenesis.” In this case, different populations of the same species evolve into two or more species. Much of the time, populations of the original species stick around and can do so indefinitely, so long as the environment allows. There are several ways cladogenesis can happen. Most commonly, populations get separated by some sort of barrier, like a river or mountain, possibly a volcano. It can be anything, so long as it prevents breeding and thus gene flow between the populations. This can even happen if populations diverge from each other by specializing in different parts of the same area. 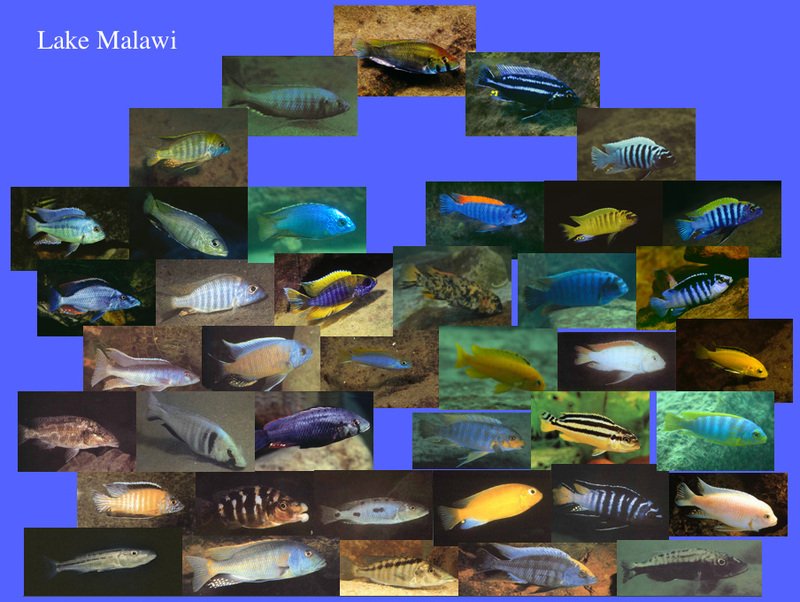 Probably the most famous examples of this are the cichlid fish in Africa. They have formed numerous species by specializing in different microhabitats within the same geographic area. 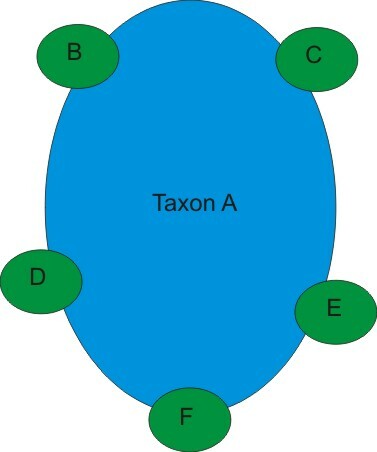 Taxon A is the original generalist species. B-F are new species evolving at the edges of the original range. Another way cladogenesis can occur is by what is known as “peripheral isolates”. In this situation, you have a generalist species that has a wide range due to its ability to fit into multiple niches. However, subpopulations can evolve to specialize into the different niches to the point they no longer breed with the main ancestral species. This form of cladogenesis is very similar to the ones listed above. In a way, it can be considered a combination of them, with subpopulations adapting in different geographic areas. The important point in all this cladogenesis talk is that at no time is it ever required that the original species go extinct. They can and often do at some point, but cladogenesis does not involve a species changing into another, it involves a species splitting up into multiple species. Much like parents are free to live their own lives once the children leave the nest (and even while the kids are still at home), once a species splits, each new species follows its own evolutionary path that is separate from the original species. In short, there is no linear chain of species going from one to the next. So what does this look like over geologic time? It looks something like a branching tree (or, if it happens over a short time, like a bush). The ancestral species forms the trunk at the bottom and each branch represents another split, until finally, you reach modern day, represented by the leaves. It is often argued that this does not get rid of the line of species from distant ancestor to descendant. 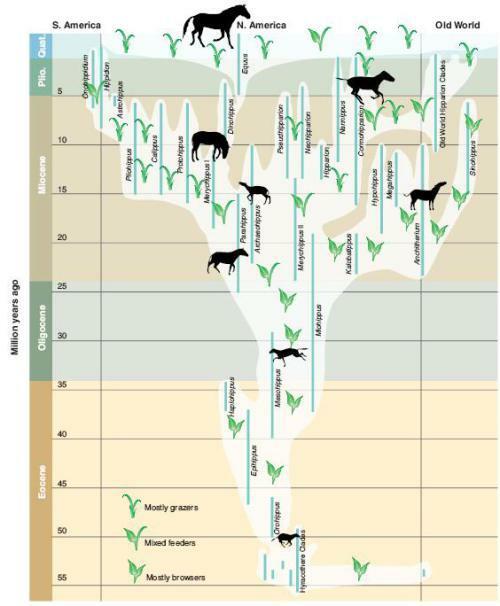 If you look at the family tree of horses, for example, you can still draw a line straight from Hyracotherium all the way to the modern Equus. It is true, you can. However, it is not a straight line. It proceeds in fits and starts, with many branches, most of which die off. It follows environmental changes and interactions with other organisms. Here is the big kicker though. 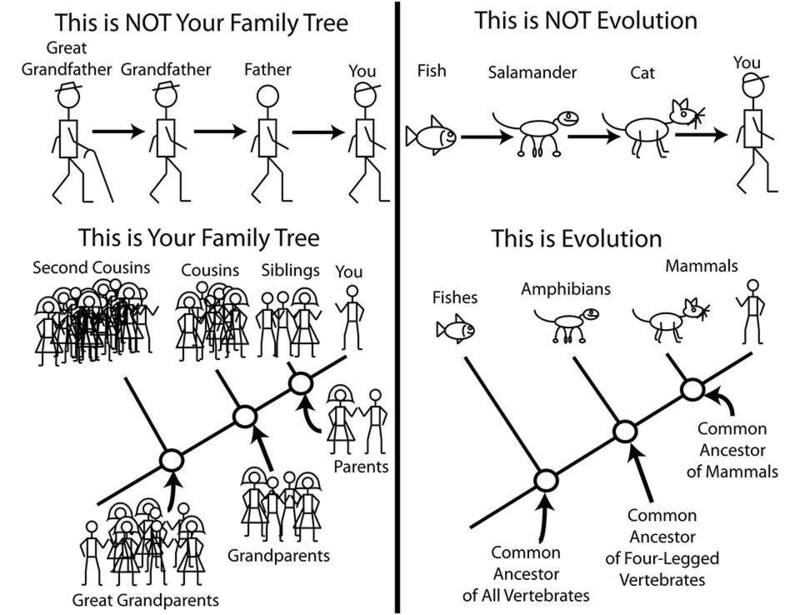 All the species sharing a common ancestor that survive at any given point of time have all evolved equally. It may not be apparent, some species may show far more changes than others, but all of them have experienced the same evolutionary time. There is no hierarchy of dominance in evolutionary terms. Every bacteria has experienced the same amount of evolutionary time as the lineage that led to humans. One can draw a straight line from a root of a tree to any leaf, but one would be hard-pressed to claim that single leaf is more important than any other leaf. So if you are looking for a reason to support human superiority, evolution will not help you. As a result, evolution can be a serious blow to the human id. To those people who have problems with evolution on this basis, I ask you to consider that simply because bacteria have experienced the same time for evolution, that does not diminish human accomplishments. 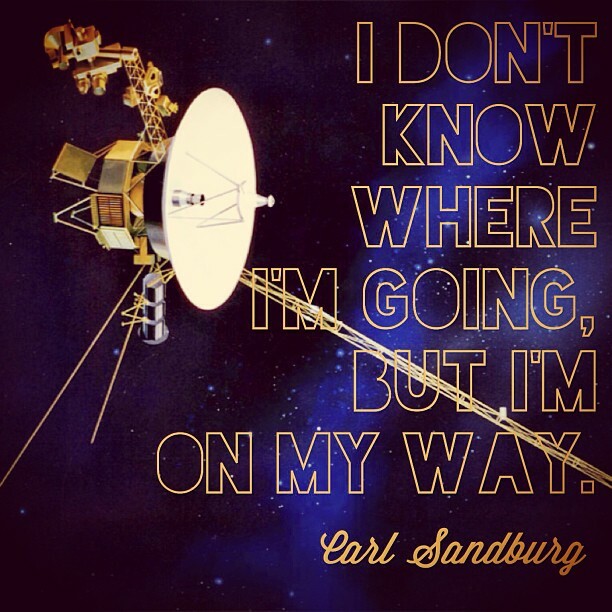 We have built communities that span the globe, we have explored the edges of the solar system and beyond. We have accumulated vast stores of knowledge that we have preserved for our descendants. We have glimpsed the inner workings of life itself. We have witnessed the awe-inspiring glories of the universe. If you need something to take pride in humanity, do not look to our evolutionary heritage, look to what we have achieved that is unmatched (as far as we know) by any other organism. As we so often tell our children, it is not where we came from that determines our worth, it is who we make ourselves to be. Were you able to figure out last Monday’s mystery fossil? For a reminder, here it is again. Two people correctly identified it as a plant fossil. 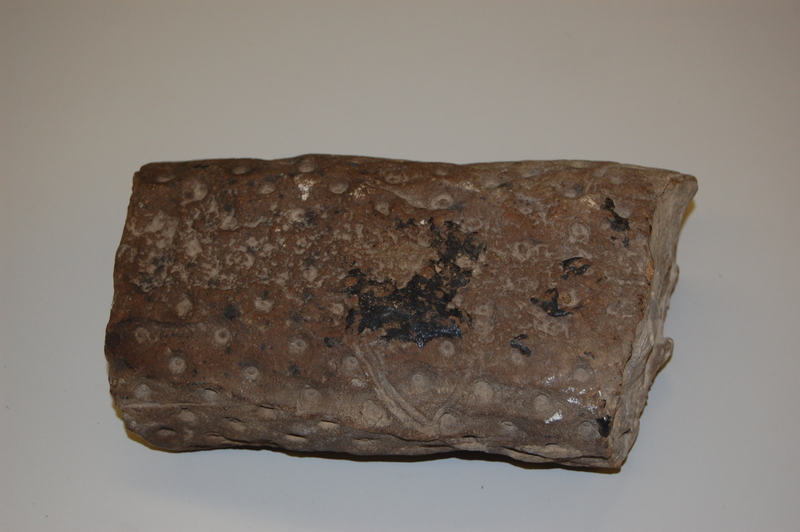 While both guesses were fossils that are found in Arkansas in similar places and times, the Natural Historian identified this as a Stigmaria. 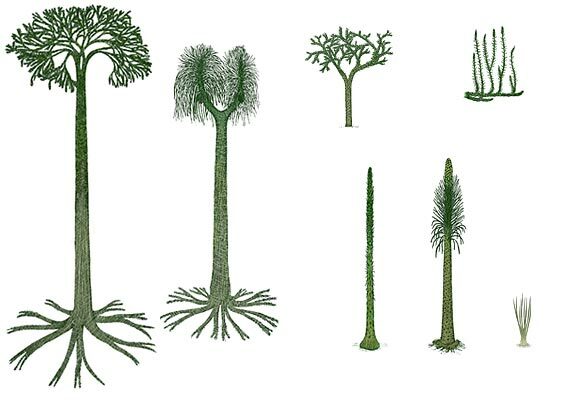 Technically, Stigmaria is a “form taxon”, meaning that it is named for the shape and not the actual organism, but in general, the only ones that really get called Stigmaria are root casts of lycopsid trees. The two main ones are Sigilaria and Lepidodendron. This particular one is Lepidodendron, which is the typical one found in Arkansas. Lycopsids like Lepidodendron lived during the Carboniferous Period from about 300 to 360 million years ago, so named because this was the time of extensive coal swamps. Coal swamps, as the name suggests, were responsible for most of the coal we find. During this time, organisms capable of digesting lignin, a chief component of wood, had not yet evolved and spread sufficiently to make a dent in the decaying logs. Lignin is a tough fiber, so without organisms capable of breaking it down, it tended to last for a long time, so decaying plant matter built up, eventually being compressed into coal. Genetic studies indicate that the enzyme to digest lignin first appeared around 300 million years ago, which likely not coincidentally marks the beginning of the end for coal swamps, which by and large died out in the Permian Period, not long after the end of the Carboniferous. Lycopsids today include the quillworts, spike mosses, and club mosses, although Lepidodendron is most closely related to the quillworts. Today, these plants are small and serve mostly as ground cover. In the Carboniferous, they formed towering trees reaching over 40 m tall (just for comparison, the average oak tree is no more than 20 m, although they can get up to 30 m tall). They also grew very quickly, reaching maturity in only a few years, which likely also contributed to the massive buildup of decaying plant matter. Lepidodendron literally means “scale tree”, so called for their scaly appearance. They have occasionally been mistaken for fossils of snake or lizard skin. Personally, they remind me of giant pineapples. Upper Atoka Formation in Arkansas. Courtesy of the Arkansas Geological Survey. Lepidodendron can be found in most of the Pennsylvanian age rocks in Arkansas, although the most common place is in the upper Atoka Formation in the Boston Mountains and the Arkansas River Valley through the northern section of the Quachitas. The Atoka Formation is a series that represents deep marine sediments at the base of the formation gradually turning into deltaic deposits in the upper sections. There are several layers of coal, coally shale, and oil shale. I have even seen a few spots in which the amount of oil in the shale is enough to smell it and the rock can catch fire. This region has not been extensively used by the coal and oil industries because it is prohibitively expensive to extract the oil from the shale and the coal is high in sulfur, making it less than optimal for use. But if you are looking for plant fossils in Arkansas, it is the place to go. Halloween is over, time to get back to work for a few weeks before we take off for Thanksgiving. To get your brain back into gear after eating all that candy and waking up from sleeping like a log in your sugar coma, can you figure out what this week’s fossil is? Check back in next Monday for the answer. I will be at a conference on Thursday and Friday and will likely not be able to post an answer until after the conference is over. Or you can check the Facebook page for a quicker answer.